This is a shot of our 6 lovely girls. From left to right is Nocturnal, Electra, Apollonia, Patience (in the back) and Coco. Alpacas are a member of the camelid family which includes camels, llamas, vicuna and guanaco. They are native to the Andes altiplano, and as such, are much more comfortable with cold weather. 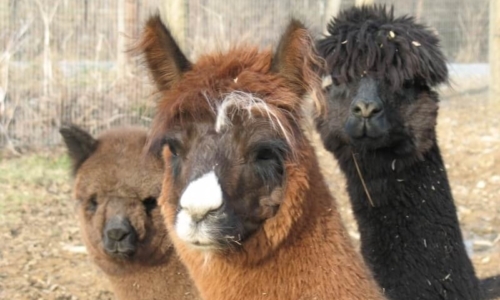 Alpacas were originally imported from Peru, Chili and Bolivia. Imports have now been closed from these countries. Are Alpacas Friendly? What Do They Eat? Alpacas are herd animals and they do not do well without a fellow alpaca around. They are ruminants, so they graze on pastures and chew a cud. During winter we supplement their diet with hay. We also feed them a small amount of grain twice a day to assure that they are receiving adequate quantities of vitamins and trace elements that are essential to their diet. Centuries of grazing on the high plateaus of the Andes have accustomed them to a hardy outdoor life. Although we provide a barn and run-in sheds they prefer to be outside and “sleep under the stars”. They typically seek shelter only when it is raining (they don’t like their heads wet) and in the severest of weather conditions. Alpacas are typically sheared once a year in the Spring. This is done to harvest their fleece, which is converted to yarn, and then to luxury garments. In moderate to warm climates it is essential to shear the animals so that they do not overheat in the summer. Alpacas are sensitive to warm temperatures. In fact, on the hottest days we provide large fans in the barn to cool the animals off. They spend many a summer afternoon lazin’ in front of the fans!